Milwaukee open reel long tapes deliver on best in class accuracy and durability. Both offer nylon bond steel blades that have minimal stretch and wont kink or tear from abusive conditions. Milwaukee long tapes have industrys first debris wiper, Grime Guard, that prevents dirt, dust and debris from entering the tape, causing jams. Furthermore, reinforced 3:1 metal planetary gears and metal handle guarantees durability in the toughest jobsite conditions. Tbook.com crawls the web to find the best prices and availability on Tape Measures and related Tools and Hardware products like Milwaukee 300 ft. Open Reel Long Tape Measure. For this page, related items include products we find that match the following keywords: "Tape Measure" at our vendor partner Home Depot. 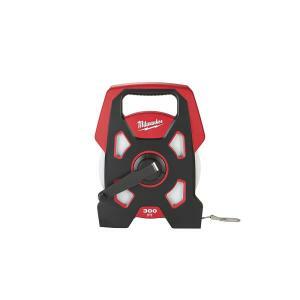 Milwaukee 300 ft. Open Reel Long Tape Measure is one of 111 Tape Measures and related products listed in the Tools and Hardware section of Tbook.com If you have any questions on this product, please give us a call at 734-971-1210 during the hours of 9am - 5pm EST for assistance. Thank you for shopping at Tbook.com, the Internet Department Store!